There will be an open house Thursday to meet Tavia Melhus, the new full time executive director with the River Valley Healthy Communities Coalition. 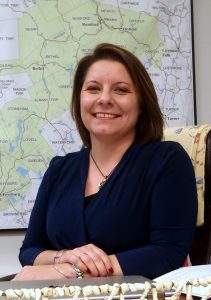 RUMFORD — An open house will be held Thursday for the public to meet Tavia Melhus, the new, full-time executive director of River Valley Healthy Communities Coalition. The 5:30 p.m. event will be held at Rumford Hospital, 420 Franklin St.
“We’re still figuring out where we’re going to go. I’d like to get feedback on what people’s needs are; meet as many different organizations as possible and connect with them,” said Melhus, who has made it a priority to meet with the public and the schools during her first seven weeks with RVHCC. Melhus leads a three-person staff. Allie Burke is director for the drug-free communities program. Melissa Harding assists Allie at the schools and helps implement the food insecurity grant with the monthly senior food commodities distribution. “One thing I’ve noticed, as an outsider coming in, is that there are a lot of nonprofits in Rumford and we’re beginning to chat about would it be better to combine,” Melhus said. “That’s because many of them share the same people on their boards. During her time here, Melhus said she has noticed groups throughout Oxford County and in the River Valley area working collaboratively, by choice and by necessity. Small groups in the River Valley are also planning with each other. Over time, Melhus said, what RVHCC has done has evolved. The gaps and needs have changed in the community. Melhus, who recently moved to Norway from Nashville, Tennessee, has an extensive background in nonprofits, including Corgi Rescue of Middle Tennessee, which she founded and has directed since 2009. Her recent positions include account specialist and account manager at the American Red Cross of Nashville. Her husband’s family members are longtime Norway residents and own Norway Brewing Co., a craft brewery and restaurant. For more information about the River Valley Healthy Communities Coalition, call 207-364-7408.